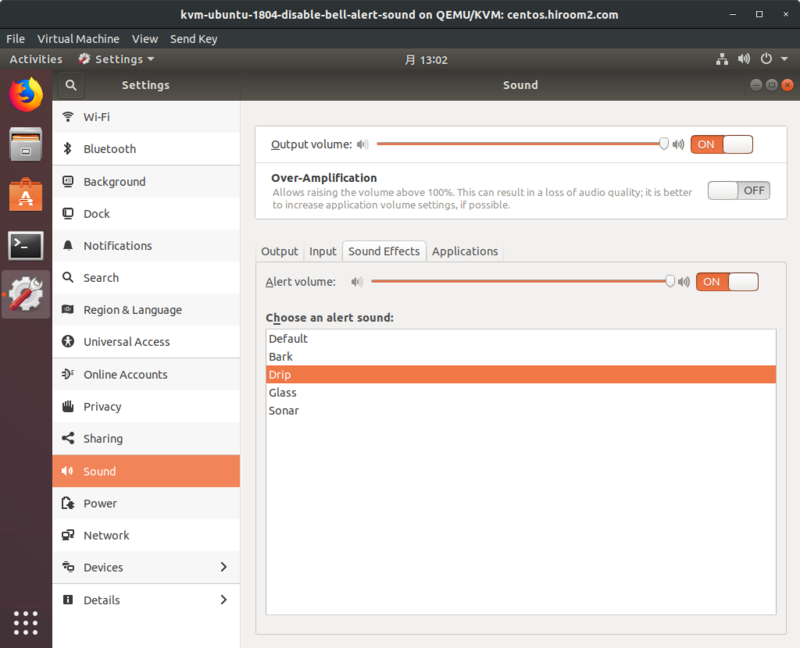 This article will describe a way to disable bell and alert sound on GNOME3 desktop environment. For example, when I try to delete character with Backspace key on GNOME Terminal, GNOME Terminal will make a sound if there is no input string. Though GNOME Terminal tell me not to press Backspace anymore but I feel that this sound is annoying. GNOME Terminal can stop to make a sound if unchecking "Terminal bell". But there are applications which makes a sound but does not have "sound off" option. While GNOME3 desktop environment provides "all sound off" option, this article makes off only bell and alert sound. /usr/bin/start-pulseaudio-x11 will disable bell sound if bell.ogg is not exists. Replace Drip.ogg of alert sound to be a silent ogg file. Open "Settings". At the "Sound Effects" of "Sound", Set "Choose an alertsound" to "Drip" with double click (single click does not apply changes).